My name is Leslie-Alin Tewes. Tewes rhymes with good news... and, I have good news for you. I am an Aging, Disability and Medical Care Manager in private practice helping people with acute or chronic illness and aging as well as those in life-transition navigate the health care/home care system to reach better medical and health outcomes with less stress. With a personalized approach and in a comprehensive manner, care is improved by coordination and integration across the health care continuum. A Patient Advocate who works with your medical team to raise the bar. With extensive credentials, I know from both a clinical and operational/regulatory perspective how to get the finest care. A health care expert and insider. I provide consultations and remote care management services nationwide, but most often in New York and Connecticut. Headquartered in Ridgefield, CT with satelite offices in Carmel, NY and Port Jefferson, NY. 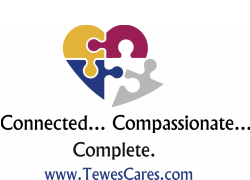 TEWES CARES. Guiding from overwhelmed and uncertain to relieved, informed and assured to better care for the ones you love.